his post contains affiliate links. When you purchase through them, you help support our ministry at no extra cost to you! Thank you! We receive SO many questions from boy moms about boys and sexuality. The topic can be confusing, heavy, embarrassing, and complicated, but it doesn’t have to be scary. Having “the talk” cannot and should not be avoided, but you’re not alone. Our friends, Luke and Trisha Gilkerson of Intoxicated on Life, are here to help with a brand new biblically-based video course for parents! These great tips are just a preview of what you will get when you sign up for Having the Talk, which includes 8 video lessons, 3 bonus lessons, and a digital download of The Talk, the Gilkersons’ ebook that started it all. 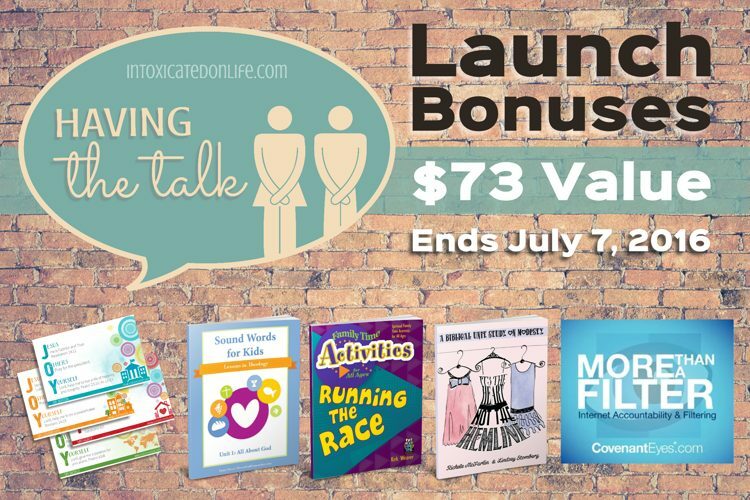 This course is already a huge value, but if you purchase through July 7th, you will also get a bonus package worth $73! The bonus package includes several great resources, including a free 60-day membership to Covenant Eyes, an internet accountability and filtering program. While the course is available indefinitely, these free bonuses will go away after Thursday, July 7th! DON’T MISS OUT – ENROLL IN THIS AMAZING COURSE NOW!